HOBART, Tasmania, Australia, February 4, 2013 (ENS) – The month of January, usually the prime whale catching month for the Japanese whaling fleet in the Southern Ocean, has come and gone without the death of a single whale, says Sea Shepherd Conservation Society Australia Director Jeff Hansen. 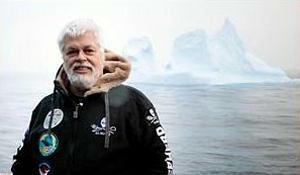 It is the international organization’s ninth Antarctic Whale Defense Campaign, Operation Zero Tolerance. This season’s campaign is under the direction of Sea Shepherd Australia, now that founding president Paul Watson has handed authority to Hansen and former Australian Greens leader and senator Bob Brown. Authority was transferred in December in compliance with a U.S. court restraining order and after Watson’s escape last summer from Germany, where he was detained on bail for possible extradition to Costa Rica. The Sea Shepherd fleet of four ships, one helicopter, drones, and more than 120 volunteer crew from around the world has to date succeeded in keeping the four-vessel Japanese fleet of “research” whalers separated on the run, making it impossible for them to catch whales, Hansen says. Now two interlinked battles are underway – in the courts and at sea, where ships from both sides are maneuvering to block each other. 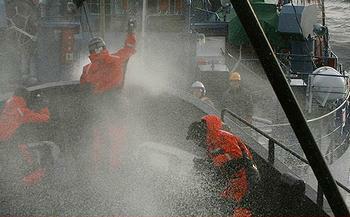 Since 2008, the Japanese whaling fleet has been in contempt of an Australian Federal Court order that prohibits them from killing whales in Australian territorial waters. Despite the ruling, Japan’s Institute for Cetacean Research announced that it intends to kill nearly 1,000 minke and 50 endangered fin whales during its 2012/2013 whale-hunting season in the Southern Ocean. 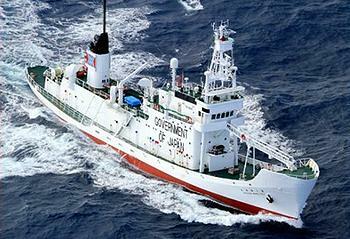 The whalers’ lawyer claims that, in violation of the injunction, the SSS Brigitte Bardot came within 20.25 yards of the Yushin Maru No. 3 on January 29. Today “The Age” reports that the group’s Melbourne lawyer takes the position that Sea Shepherd Australia is responsible for the group’s Antarctic campaign and the Australian chapter is not subject to the restraining order of the U.S. court. 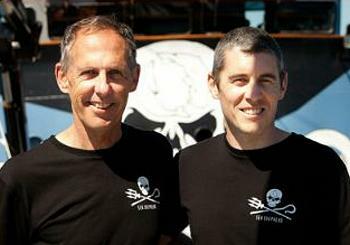 The U.S. Sea Shepherd Conservation Society has no shares in, nor control over, the Australian chapter, which is now run by Australians – Hansen and Bob Brown, the former senator and leader of the Australian Greens. The Discovery Channel’s Animal Planet’s Emmy-nominated show “Whale Wars” has documented the Sea Shepherd’s whale defense campaigns for the past five years and is also onboard this season.